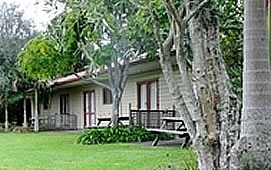 Whananaki North Motel & Holiday Park is situated on the pristine Tutukaka Coast. 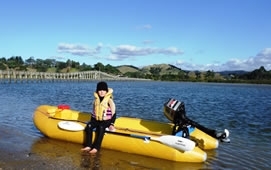 With Northlands most spectacular coast with it's hidden coves, wonderful beaches, islands and the Whananaki estuary to be explored, who needs anything else. Whananaki Holiday Park is right next to the Longest Foot Bridge in the southern Hemisphere and makes the short walk to Ocean beach a dry one even at high tide. Whananaki is a renown surf spot with 'The Bar', Sandy Bay, and Moureesses all in close proximity to the Whananaki Holiday Park and camp ground. There is the boat ramp down the road for those who have the larger ski boats and want to explore further afield. With the Poor Knights just 22km off our coast it is the perfect place to launch from. For the inshore marine explorers there is diving, rock fishing, kayaking and kite surfing all around us. The camp has kayaks for hire. With the estuary right beside the camp you have safe, warm water to swim and boat in with out having to travel anywhere. Not only are we in the middle of a water mecca but we have great walking trails as well. Being on the Te Araroa (NZ trail from Cape Reinga to Bluff, 3000 km) we have numerous trampers from all over the world passing through and staying at Whananaki Holiday Park. We even have a special TA hut, The Naki'd Inn, for those tired and wet trampers. Between Sept '14 and Feb '15 we accommodated 117 TA trampers. Numerous others stopped in for a chat, cup of tea and even a Xmas lunch before heading off again. Surrounded by green pastures and native forests there is just so much to do. Anyone interested in birding or photography, you will be spoilt for choise for what Whananaki has to offer. The local store is right next door to supply you with all your holiday supplies, take aways and dive refills. We are the only Swop and Go gas suppliers in the district. We offer 9kg swop and go or full purchase and now 4.5kg bottles as well. We are the only pet friendly (conditions apply) caravan and motor home park in the area. Whananaki Holiday Park now also offers our clients a wood fired pizza oven and BBQ and natuaraly our large well equipped camp kitchen and the only hot showers around. We have a fully equipped holiday park which offers motel units, tourist flats, cabins and campsites, both powered and non-powered. Camp ablutions are clean and tidy and we have accommodation for up to 8 people in the tourist flats. 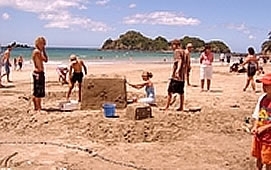 Whananaki has plenty of activities and attractions to offer its visitors. Home to the Southern Hemisphere's longest walk bridge, some of Northland's most spectacular beaches and numerous walks including the Capitaine Bougainville Memorial, it is a wonderful place to explore. Whananaki and surrounding beaches are absolutely amazing. The Tutukaka coastline has many incredible beaches perfect for fishing, swimming and enjoying the sunshine. Sandy Bay, Whale Bay and Whananaki are some of the best.